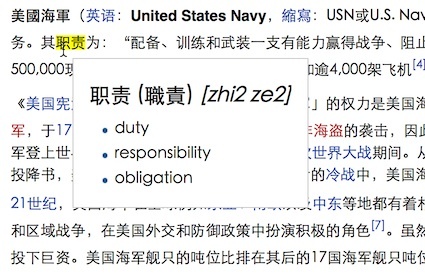 Frill is a Chinese to English pop-up dictionary extension for Safari that I wrote after I started using Safari as my main web browser at home. It uses the CC-CEDICT dictionary, which has over 100,000 definitions. It supports both simplified and traditional characters. There’s a toolbar button to enable/disable it. It’s open source, released under a CC-BY-SA license. Please feel free to give any feedback, especially bug reports or feature requests. I’d love to hear from anyone using it! Learned about this from a tweet… trouble free fast download… on a quick spin through a few Chinese documents it seems to work extremely well. Thanks for an exceptionally useful tool. This is useful. Many thanks for putting this together. Can you add some customization to resize fonts, etc? Also saving words to a default list. I meant to thank you for your awesome Safari’s extension. The only thing that was preventing me from using Safari over Chrome over the past years was the absence of a mouse hover chinese translation! Now you’ve done it and I’m saved, I can get back to Safari! So a big “thank you” for your work! This is fantastic! The app works great and is really helping me improve my Chinese. Before reading articles was so laborious, because I’d have to stop and look up words. This is incredibly easy. I realize you’ve put a lot into this little labor of love, so thank you SO MUCH!